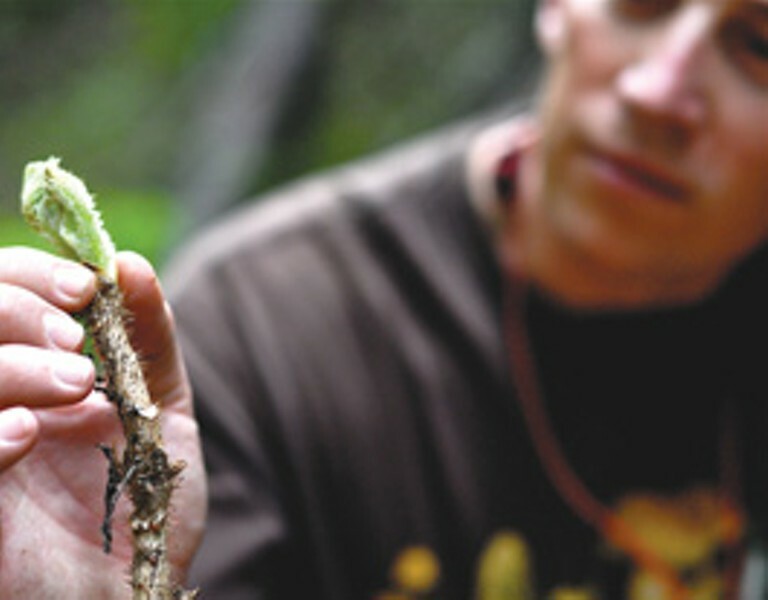 RESINY EDIBLE: Cook holds a newly emerged bud of the 'rather argumentative' devil's club plant. It's the outlaw mushroom hunters, those hardy souls that venture into the wild without compass, that most intrigue Langdon Cook—almost as much, he says, as the rumors of gun battles that have ensued over secret, bountiful mushroom spots. "I'm fascinated by the mushroom people. They're making a living in this underground economy, which in many ways is the last gasp of the Wild West," says Cook, on the phone from his home in Seattle. "A lot of people would be nervous to be off-trail, bushwhacking deep into the wilderness, picking mushrooms and then trying to find their way out at the end of the day as it's getting dark. It's definitely not everyone's cup of tea." Cook writes about his own adventures foraging for fiddleheads, Dungeness crab, huckleberries, morels and squid in his essay collection Fat of the Land: Adventures of a 21st Century Forager (Skipstone Press; $26.95). Raised in Connecticut, Cook didn't grow up picking wild foods; if anything, his childhood food history is supremely all-American: TV dinners, processed foods and sugar. "Food was bought at a grocery store, mushrooms were toadstools, and all greens were potentially poisonous if they came from the wild," says Cook. It wasn't until the aspiring journalist moved to Seattle from the Bay Area, in 1991, that he began spending more time in the outdoors. "The next thing I knew," Cook says, "I was planning to go morel hunting or free diving for crabs or spear fishing lingcod." Realizing the preciousness of foraged foods—he likens a morel bounty to "pirate's booty"—Cook began learning cooking techniques from his wife, who was from a Polish-Italian family that handed down recipes. The cooking and the foraging began to inform each other. "You want to do something that honors the food and really makes the best meal possible," says Cook. Each essay in his collection ends with a recipe, as well as tips on preparing crabs, oysters, shrimp, fiddleheads and dandelions. Cook now leads foraging tours in Seattle and sometimes teaches local chefs how to search for wild foods. But after nearly 20 years of foraging foods on land and sea, Cook says the novice should start close to home, unlike the fungi renegades of what's known as the "Mushroom Trail," a route that runs from Northern California to Alaska. "Start with the weeds in your own backyard and then get more adventurous as you go," says Cook. The golden rule is to never eat anything that you can't identify with 100 percent certitude, he says, and finding a mentor is the best option of all. "I wouldn't just start trying to identify plants through pictures in a field guide and start grazing, because you can get yourself into trouble," says Cook. "It really helps to go out with someone and see these plants and fungi in the wild, what they look like, get a sense of them, hold them in their hand." After that, it's only so long until that food gets buttered up in a pan, tossed onto a plate and fearlessly eaten. Langdon Cook appears on Wednesday, April 20, at Copperfield's Books (138 N. Main St., Sebastopol; 6pm; 707.823.2618), and speaks on Thursday, April 21, to the Sonoma County Mycological Association meeting at the Sonoma County Farm Bureau (970 Piner Road, Santa Rosa; 7pm; www.somamushrooms.org).